What acupuncture points are located on your legs and feet? 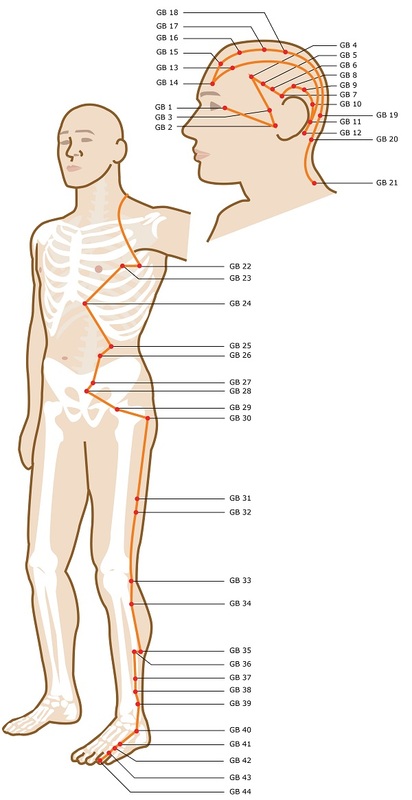 On this page I'll show you all of the acupuncture meridian points from our free online acupuncture points guide that are located along your legs and feet. There are seven primary meridians that contains pathways and points that lie along your legs and on your feet. There are also ​four extraordinary vessels that contain some of these points. Extraordinary vessels don't have their own acupuncture points, but instead are simply energy pathways that flow between points found in the primary meridians. Acupuncture Points: Right Foot vs Left Foot? All of the acupuncture meridians in the body are symmetrical. This means that every meridian, and every single acupuncture point, is found on both sides of the body in exactly opposite and parallel locations. ​The images you'll see below only show each meridian and each acupuncture point on one side for simplicity's sake. But rest assured, the points and energy pathways operate equally on both sides of the body. This means that you can affect the same meridian by using the acupuncture point located on either the left or right side of the body. However, if you suffer from a health condition that is only affecting one side of the body - pain in your right knee, for example - then an acupuncturist may work specifically with acupuncture points on that side of the body. Now that I've explained the basics, let's take a look at all of the acupuncture points located along your legs and feet. First up, we have the bladder meridian points. The bladder meridian seen here has two energy pathways that come down the leg and connect to form the final pathway which goes down and ends on the little toe. Please note, the acupuncture point numbers in the bladder meridian are in dispute in many academic texts. Some number the points differently. This is because there is disagreement over the proper numbering of the two branches that separate at the top of the spine and rejoin in the middle of the leg. Regardless of numbering, you can still see the ​location of the points properly. Next up is the ​gallbladder meridian. The gallbladder meridian isn't as confusing as the bladder meridian above because, like most meridians, it only has one energy pathway and not a branching pathway that splits into two. You can see the acupuncture points that come down the leg and end on the second small toe, also known as the ring toe. Next up we have the ​kidney meridian. The kidney meridian has an energy pathway that comes straight down the upper leg, then does a cute little loop de loop around the ankle area. It then comes down the foot and ends with a point right in the middle of the bottom of the foot. Next up is the ​liver meridian. The liver meridian seen here has an energy pathway that comes straight down from the crotch area on the inside of the leg. It ends with its last point on the big toe. Next we have the ​spleen meridian. The spleen meridian image here shows you what we talked about at the start of this article: that all meridians are symmetrical and have parallel energy pathways and acupuncture points on both sides of the body. This image is laid out like this for ease of depicting all the points in one image. This is because the points start under the armpit on one side of the body and then come across the torso and end on the other side of the leg. Next we have the ​last primary meridian on our list: the stomach meridian. The stomach meridian is relatively straightforward, except for the small zigzag motion that the energy pathway makes about halfway down the calf. The last point is located on the second toe. ​That's all for the primary meridians that contain acupuncture points on the legs and feet, but at the start of this article I also mentioned that there are four extraordinary meridians involved as well. We'll list those next, starting with the yang linking vessel. As you can see, the yang linking vessel has no acupuncture points of its own. No minor extraordinary vessels do. The yang linking vessel, like all of the minor extraordinary vessels, is just a lesser energy ​pathway that runs between points that are found in the other acupuncture meridians. The yang motility vessel follows a similar pathway as the yang linking vessel. The yin linking vessel is seen here. Finally, we have the last of the extraordinary vessels that has any points located along the legs and feet: the yin motility vessel. 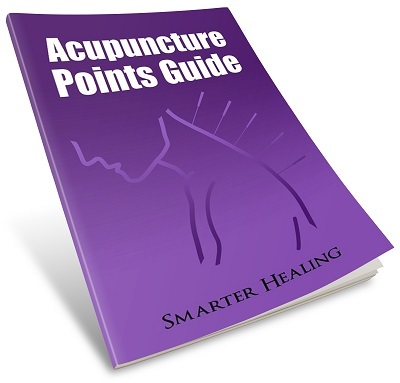 Click here to get the Acupuncture Points Guide.